When you rummage around in iTunes the way I do, searching for quality iPad children's apps, it's striking how some story apps have been made with skill and care, thinking about young children and their interests - and well, others haven't. Because I love both great writing and beautiful illustrations, I have literally shuddered over some very poor book apps. Some have pictures - but not illustrations. Some have words on pages - but not stories to engage children's hearts and minds. Luckily, I found the Stella and Sam apps! Today I'd like to tell you a little about both the Stella and Sam Story Pack, and Draw Along with Stella and Sam. 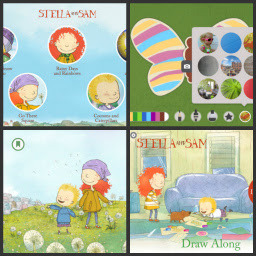 The Stella and Sam Apps are based on the television show and the bestselling picture book series by Marie-Louise Gay. Stella and Sam books have been translated into fifteen languages. They have sold over one million copies and are loved by children all over the world. These five interactive stories are perfect for early childhood and Kinder kids. I like that they're gentle, and centred around everyday experiences and play that kids will relate to. This isn't a book app - there are no words on the screen to read along with. 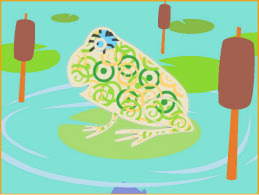 They are animated story adventures, and take the kids on journeys in the woods, through puddles, and into fun. Every so often, in a natural-seeming way, the story is interrupted for young "readers" to complete a task - perhaps to build a bridge from flowers so ants can cross a stream, to echo bird calls, or to dress a snowman. This interactivity is done very well, and the illustrations themselves are beautiful - soft and cartoonish. Navigation is simple and logical. Even the voices are good - this is a quality app with great attention to detail. Neither of these apps is free. The links above will take you to iTunes so you can check the current price. I believe both are quality apps, and worth paying for, or watch out via sites like Apps Gone Free for when the price drops. If you're interested in reading more of my iPad app reviews, you might like to check out the Pinterest board I've devoted to them. Love the Stella and Sam story pack! Both my kids love this app! I can certainly understand why! I did not get to see all their apps, but from what I have seen they are well designed learning apps. Like the two characters too. I think I read where you like Toca Boca apps, Beth? At zinc Roe's website, there's a press release about them working together. http://www.zincroe.com/news/show/zinc_roe_joins_toca_boca Exciting times ahead!